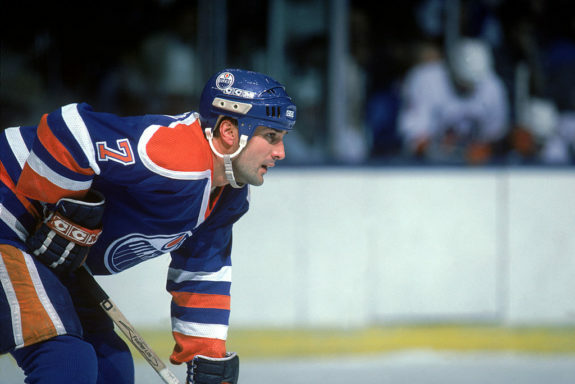 Unless you were fortunate enough to be around to witness Paul Coffey play during his prime, it is unlikely you can comprehend how important he was to the success of the Edmonton Oilers. Anyone can look at his stat line and be impressed by the eye-popping totals. However, those numbers do not tell us just how integral his role was in helping those teams find their identity and become arguably the greatest team in NHL history. As great as Glenn Anderson, Jari Kurri, Mark Messier and Wayne Gretzky were, those record-setting sides of the 1980’s would never have come to fruition without a certain player who wore the No.7. 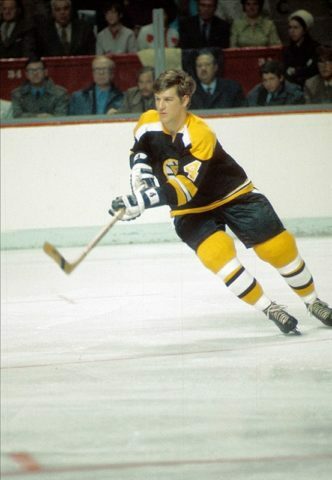 From a numbers perspective, we are talking about the only defenceman in history who approached the level of Boston Bruins legend Bobby Orr. The production Coffey delivered from 1981-82 through to 1985-86 was downright staggering. During that five-year stretch, the future Hall of Famer put together a run, (183 goals, 387 assists, and 570 points in 499 games), that stands up favourably against any similar stretch Orr had during his career. Don’t get me wrong, there is no comparison between the two as all-around players but as an offensive weapon from the backend, the sixth overall selection in the 1980 NHL Entry Draft more than holds his own against Mr. Orr. Each player owns five of the top ten scoring seasons in NHL history among defenceman and the numbers are eerily similar. As impressive as all of that is, it was the grace and elegance in which Coffey moved on the ice that made him so special. Be it carrying the puck with his ridiculously smooth skating style or making precision-like passes to streaking forwards, watching him play the game in the manner he did was special and something no one had seen since the days of the Bruins No. 4. Simply put, it was poetry in motion and the only thing as jaw dropping as watching the Weston, Ontario native glide from one end of the rink to other, was seeing No. 99 do his thing on a nightly basis. Hard to imagine but Coffey was that good. His style of play allowed the Oilers talent upfront to think outside of the box when attacking opposing teams. Everyone knew the talented rearguard would either be leading or joining the offensive attack and it was a weapon no club other than those Orr-led Bruins sides had at their disposal. The argument could be made that next to Gretzky, the three-time Norris Trophy winner was the most vital piece of the puzzle that led to the club enjoying the success it did. While the Oilers did manage to win a pair of championships after he was traded to the Pittsburgh Penguins for Craig Simpson during the 1987-88 campaign, without Coffey in the mix Edmonton would never have become the kind of team they did. There would have been no 400-goal seasons and chances are quite good that none of those players reach the levels they did…including the Great One. Does anyone honestly believe for a second that it was a coincidence both Gretzky and Mario Lemieux enjoyed the finest seasons of their careers with a certain blueliner as their running mate? No question the game today is much different compared to then but can you imagine what kind of damage Connor McDavid could do with a guy like Coffey pushing from the backend? Having a player with the ability to transition the puck up ice at an elite level is as important a piece to the puzzle any team can have in their arsenal. It was the case back then and it still holds true to this day. Though never considered a great defensive player, he was not the disaster some make him out to be in his own end of the rink. The 14-time All-Star was never one who would drop to the ice and block shots or engage in fisticuffs with regularity but he played a far grittier game than most give him credit for. Also, he was a master at anticipating plays and turning odd man rushes against into an instant breakout and potential scoring opportunity going in the other direction. Whether it was with Edmonton or on the international stage with Team Canada, it was skill-set he used to his advantage time and time again. Like the rest of his Oilers teammates, Coffey kicked it up a notch come playoff time and that was never more apparent than during the team’s 1985 playoff run…12 goals, 25 assists and 37 points in 18 games. Four of those goals were game-winners and it put the defender in the running for Conn Smythe honours along with netminder Grant Fuhr and Gretzky. Point totals aside, his overall game was at a level he had not previously reached and was a precursor to his record-breaking campaign that followed during the 1985-1986 season. While that year’s post-season MVP ultimately went to the greatest player who has ever stepped onto a sheet of ice, the performance Paul Coffey delivered remains the measuring stick for all defencemen. His goal, assist and point totals still stand as NHL Playoff records to this day. Chances are no one comes close to approaching those marks in the near future but to do it in as few games seems almost unimaginable. As far as the aforementioned ’85-’86 campaign goes, there are no words that can do his performance justice. 48 goals, 90 assists, 138 points, +61 plus/minus rating and 28-game point streak. Coffey registered at least one point in 63 of his 79 appearances and picked up no fewer than three points in 17 of those games, including an eight-point effort against the Detroit Red Wings which matched a certain someone’s team-record. He paced the league in shorthanded goals with nine, finished in a tie for seventh in goals with Lemieux and just three points back of the Pens superstar for second in league scoring but was well back of Gretzky’s absurd total of 215 points. At 24 years of age, he surpassed Orr’s record-setting total of 46 goals set back in 1974-75 and fell just one point shy of his career-high total of 139 points from 1970-71. There has been only one other season in which a defenceman reached the 40-goal mark in league history and that too came courtesy of the Oilers brilliant blueliner in 1983-84. Paul Coffey would go on to enjoy many other great seasons after his departure from Edmonton, most notably with the Pittsburgh Penguins and Detroit Red Wings. On their own, those years would have likely still earned him entry into the Hockey Hall of Fame but it was his years with the Oilers that placed him among the upper echelon of greats to have ever played and one of the games truly unique talents.